I've been to Henley before, back when Boris was its MP and not (quite) Mayor of London. It remains a moneyed town, where ladies and gentlemen brunch in the High Street, where cyclists with £1000+ bikes muster for a jaunt, and where men were wearing maroon trousers long before they became fashionable. This nine mile hike along the Thames Path begins at the town bridge, which'll be the last road to cross the Thames until the other end of my walk. Just north of Henley the Thames conspires to be straight, thus the ideal spot for the first Oxford and Cambridge Boat Race in 1829, and for all the rowing events in the 1908 Olympics. Visit in high summer and the banks of the river are lined by regatta-ready grandstands and hospitality pavilions, whereas by October all you'll see are folk out practising. Various sculls and fours and eights row by, most pursued by a coach on a bike yelling instructions (or abject scorn) through a megaphone. "What are you doing Anthony?! Is that what I told you?!" Coxes have to guide their boats through the choppy wash left by cruisers and motor launches, and occasionally avoid turbo-charged swans flapping headlong down the centre of the river. Sooner them than me. The folly on Temple Island at Remenham is often used as a finishing line for oared races. It's also where I passed a local man shouting "Boris Boris Boris! ", although this turned out to be the name of his Cairn terrier, a mischievous little soul. Here the Thames bends east, which is the general direction of travel for the rest of the walk. Ahead are wooded slopes rising to low hills beyond, with the first shades of autumn beginning to appear (thus far, it seems, leaf-minered horse chestnuts only). The big white mansion on the bend is Greenlands, built by W H Smith out of the not inconsiderable profits from his newspaper business. Next comes Hambleden Lock, the limit of travel for all those in rowing boats (and where strollers from Henley tend to turn back). Larger craft queue until the lock-keeper is ready to beckon them in, while those on foot wait for him to close the gates so they can walk across. Be sure to divert here briefly to view the weir, a long thundering torrent of water with a narrow metal footpath zigzagging above - a most unexpected river crossing. And to view Hambleden Mill at the other end, its glorious weatherboarded frontage crying out to become a 1000-piece jigsaw (whereas in reality it now contains £2000 per month flats). That's it for the busy part of the walk. The meadow that follows is much quieter, and much more open, at least as far as Ferry Lane. Here the riverbank ahead is blocked, forcing a detour up a muddy potholed lane into the village of Aston. If you like pubs the Flower Pot will do nicely, else continue uphill through the grounds of Culham Court. This is one of Britain's most expensive country houses, last sold in 2006 to the Swiss financier Urs Schwarzenbach for £35 million. It therefore comes as a pleasant surprise that the Thames Path retains a public right of way through his estate. This passes directly between the front garden and the river, on a slope with panoramic views across the Thames Valley, then beneath considerable contoured landscaping designed to shield the house from view. However several signs advise walkers to keep off the rest of the estate, and umpteen implore "no cycling" (not that anyone on two wheels was paying a blind bit of notice yesterday). The Thames beneath Medmenham is a secluded highway for those with expensive white motorboats. Retired couples and family groups chug by, along with the occasional public school party messing about on the river. Meanwhile the Thames Path has returned to the water's edge, via cattle-filled meadows and horse-trampled tracks. At Frogmill a suite of posh converted barns switches swiftly into an estate of lovable prefab-style bungalows, each set on stilts a few feet above ground level to prevent flooding. The Neo Tudor building on the clifftop ahead (yes, clifftop, who'd have imagined?) is Danesfield House, now a hotel with what must be stunning views over the Thames below. For mere mortal walkers a series of meadows lie ahead, well frequented by Sunday daytrippers. One extended family group had split into men playing volleyball and women nattering round a half-eaten picnic, while two daughters sat in the car with bhangra blaring out for entertainment. I spotted an ice cream boat on the opposite bank, a giant plastic cornet on the roof, but going nowhere while its owner gave the deck a mopdown. The next lock (and the next village) is Hurley - a little less highbrow than Henley, which you can tell because mooring fees here are three pounds lower. The Thames Path nips across a high bridge to Hurley Lock Island, one of a small archipelago in this bulge in the river. I would have stopped for an ice cream but the queue at the kiosk was too long (even in October). At Temple an even higher footbridge spans the entire Thames - this opened in 1989 to replace a passenger ferry. The path now follows the Buckinghamshire side of the river, having spent the rest of the walk in Berks. There follows yet another lock, where captains must steer their craft away from the big red signs screaming "Danger" for fear of tumbling over the weir. But everyone looks far too able a boatman for that, on what must be their umpteenth journey from marina to wherever and back again. 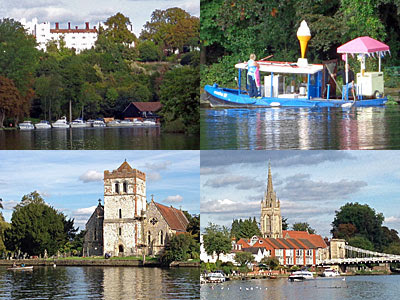 On the opposite bank is Bisham Abbey, parts of the main building three-quarters of a millennium old, and home to one of England's five National Sports Centres. That's not to be confused with Bisham Church, a lone building with fine Norman tower more immediately adjacent to the river. And here the meadowside path becomes busier, as a hint that we're now within Sunday strolling distance of Marlow. Even Nan and kids on trikes can manage this stretch, so it seems, as an adjunct to their visit to Higginson Park. Here picnics are taken, and balls are kicked, and swans and geese gather expectantly by the towpath in anticipation of chucked bread. Welcome to Marlow. The scenic road bridge ahead can only support traffic up to three tonnes, because it dates back to 1832, and is the only suspension bridge on the Thames upriver of London. 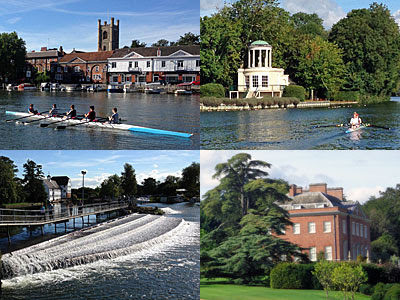 The capital's still nearly 40 miles downstream, so this is a good time to stop and investigate Marlow's town centre (very nice, but not quite Henley), and then head home. Travelling by train: Depart Paddington and change at Twyford for the train to Henley, which runs hourly at weekends. I bought a return, which I flashed to the guard at Marlow and he accepted it as valid for the way back, though you might not be so lucky. Marlow trains double back at Bourne End, then run to Maidenhead, again hourly. Walking in the opposite direction: Read this, it's a much better description than mine. Overall verdict: A splendid walk, and quite possibly even more picturesque once autumn kicks in properly.